Colorado Gov. John Hickenlooper and his allies are taking new steps toward launching a presidential campaign, including interviews with dozens of potential staffers and hiring a pollster and national fundraiser, according to a person close to the Democrat. Hickenlooper isn't expected to make a formal decision on running for president until his term ends on Jan. 8. The person close to the governor requested anonymity because Hickenlooper hasn't yet formally launched his campaign. The moves come as potential presidential contenders step up efforts to get their campaign infrastructures into place. With as many as two dozen possible candidates for the 2020 Democratic presidential nomination, there is a fierce competition playing out for talent. Hickenlooper's second term in Colorado has been consumed with speculation over a potential presidential run. But he has sounded less ambiguous in recent days. "We're beyond mulling," Hickenlooper said in an interview this week. "I think we're engaging people I've known and trusted and understand some of the subtleties around running for the highest office." Hickenlooper traveled to battleground states like Florida and Georgia during the final weeks of the midterm elections campaign, as well as the key early voting duo of Iowa and New Hampshire to test his expected 2020 message. At one point he flatly told a New Hampshire waitress he was running for president, only to have to add minutes later that he hadn't formally made a decision and note there were legal issues to saying he was a candidate. It was a typical moment for a notoriously unscripted politician who often quips there's "no more than five feet between myself and disaster." His bid would rely on his unorthodox story and quirky personality to cut through the clutter of a packed Democratic presidential primary field. "I don't think anybody else who's being talked about has been a mayor and a governor and an entrepreneur — not to mention a brewer," Hickenlooper said in the interview. Hickenlooper was a laid-off oil geologist who struck it rich founding a brewpub in downtown Denver. He parlayed that into a successful run first for Denver mayor and then governor. In his campaigns, Hickenlooper held himself out as a nonpartisan pragmatist who wouldn't run negative ads, instead featuring spots that showed him feeding quarters into overpriced parking meters or jumping out of a plane to promote a ballot measure that expanded the state budget. But there are obvious challenges for an avowedly nonpartisan candidate who spent much of his political career winning the support of Colorado's Republican business leaders. Despite implementing limits on methane and automobile emissions, Hickenlooper has frustrated some environmentalists with his defense of hydraulic fracturing and the energy industry in general, positions which may put him in a tough spot with a national Democratic primary electorate increasingly agitated about climate change. His no-negative style of campaigning may be jarring for parts of the primary electorate that yearn for a more aggressive candidate to take on President Donald Trump. His base in Colorado allows him to make a pitch as someone who can speak to the heartland, but it means he's distant from the financial centers of Democratic fundraising on the coasts. And though he has several locally high-profile African-American backers in Colorado, he has limited ties to black voters, a key slice of the Democratic primary electorate. Still, Hickenlooper's record in swing-state Colorado was appealing enough to land him on Hillary Clinton's final list of potential running mates in 2016. And his folksy demeanor and unpolished manner may play well in the era of Trump. "That careful staging, carefully managing to be politically correct and never say anything wrong — that's changed and made it possible for someone like Hickenlooper to shine," said Alan Salazar, a former Hickenlooper aide and veteran Democratic operative in Colorado. 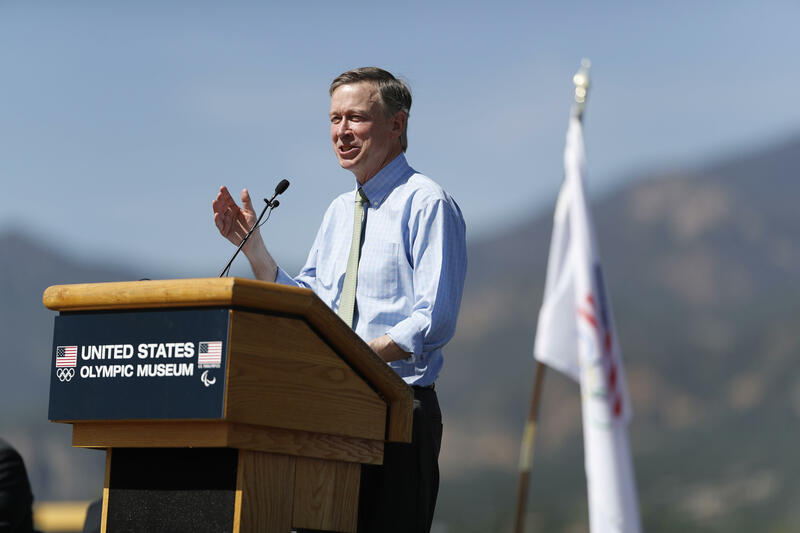 Hickenlooper's moves come as his former chief of staff from City Hall, Sen. Michael Bennet, has started to mull his own bid for the Democratic presidential nomination. Bennet and Hickenlooper are still close and advisers to both men insist there's room for two possible Democratic candidates from Colorado. Any campaign will rely heavily on Hickenlooper's record in Colorado, which became the first state to legalize recreational marijuana under his watch, although he opposed the ballot measure permitting that step. It would be based in Denver and sell him as a solution-oriented Democrat who can attract support of all stripes while achieving key liberal goals like expanding Medicaid and gay rights. "A lot of it will come down to how well we can articulate our vision of making America a place where we fulfill our role on the world stage where every human, every person in the country, has an equal shot, a fair shot at creating their own American dream," Hickenlooper said. "That kind of stuff, there's a certain amount of poetry to it — and I'm not much of a poet, but if there wasn't stuff to be learned, how much fun would it be?"